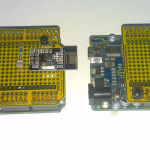 Yes its pretty obvious – more RF sensors. Might also be handy to do some indoor range testing and a network/mesh of the nRF modules. 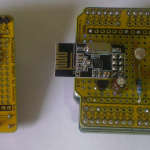 Today I partially assembled the two prototype boards. 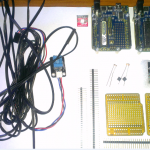 So far the LDR and DS18B20 are fully functional, and the nRF module is soldered in place but not yet wired up. Looks neat and tidy. Of course now it is partially assembled its always nice to know if everything is working. So here is some simple test code. Same story and usual, Google for some existing libraries, no need to write your own. Another day with progress. 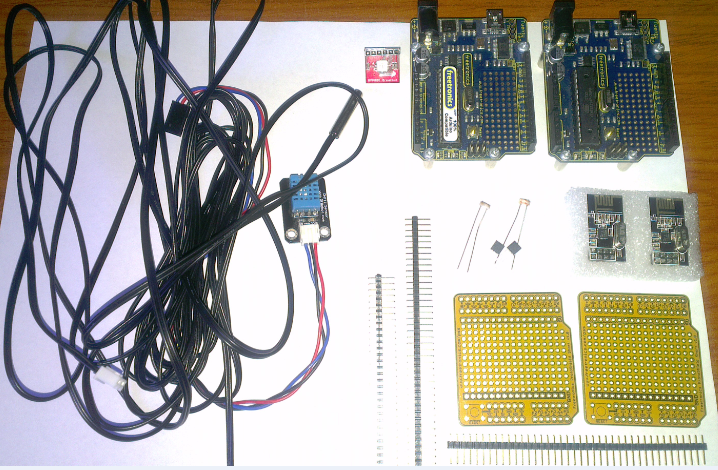 Today I wired up the nRF modules and added some more code to send the readings to the receiver. Other than a snafu with one incorrectly wired pin, it all went without other issues. Here is what the protoshield looks like now. Still pretty neat. I added the 10uF cap to the 3.3V line, cant remember why or if it is really needed, but my receiver has one so I figured it can’t hurt to have it installed. Yes the wires I have used (single cores from security cable) are really too think for anything too elegant but it was all I had laying about. Latest is now live on the Xively Stream.